CHAIRMAN: I will now deal as briefly as possible, with the matters that have arisen in relation to the health of Mr. Charles J. Haughey as a witness before the Tribunal and will also allude to some additional matters. It will be recalled that nearly two months ago it became necessary to adjourn the taking of the evidence of Mr. Charles Haughey. I took this step on the basis of information conveyed to the Tribunal by Mr. Haughey’s counsel. Mr. Haughey’s counsel’s view that his client was no longer fit to give evidence was based on the contents of a medical report of Mr. Peter McLean dated 9th October of this year. It will also be recalled that Mr. McGonigal made a further statement at the Tribunal sittings on the 16th October in which he stated that there was no regime which the Tribunal could put in place which would accommodate his client’s health needs. A further report on which Mr. McGonigal’s view was based was provided to the Tribunal later on that day, the 16th October. Up to that time Mr. Haughey’s evidence at the sittings of the Tribunal had been given in accordance with a regime of attendance devised by the Tribunal in agreement with Mr. Haughey’s counsel. This arrangement was intended to accommodate Mr. Haughey’s special health needs which had been drawn to my attention and for my eyes only in July of this year. Following the receipt by the Tribunal of the report of the 9th October, I indicated to Mr. Haughey’s legal advisers that I would have to be released from the special obligation of confidence subject to which the July 2000 reports had been made available to me. I required this release in order to enable me to take the advice of my own legal team. I was released from this obligation. Subsequently, I decided that it would be necessary to clarify the precise nature of Mr. Haughey’s medical condition so as to enable me to decide how I should proceed in relation to the taking of his evidence. I had hoped at that point to be able to make a decision as to whether Mr. Haughey was fit to continue to give evidence, and if so, on what terms, without the need to involve medical practitioners other than those by whom Mr. Haughey was being treated. I took this view because I felt that Mr. Haughey, like any other witness, was entitled to a very special degree of privacy in relation to the intimate details of his personal health. I hasten to add that Mr. Haughey is not the only person who has given evidence to the Tribunal in circumstances where arrangements have had to be put in place to accommodate a witness’s special health needs. In order to able me to evaluate the reports provided by Mr. Haughey’s own medical practitioners and in order to enable me to decide whether it would become necessary for me to obtain the services of my own medical advisers, I endeavoured to obtain access to all of the documentary material concerning Mr. Haughey’s health status. For reasons which I need not go into at this point, this documentation was not made available to the Tribunal and in those circumstances, it became clear that I could not rely exclusively on the medical reports furnished to the Tribunal by Mr. Haughey’s solicitors. I decided, therefore, to retain the services of two medical practitioners to advise me in relation to Mr. Haughey’s state of health. So that the medical practitioners I hoped to retain to advise me would have as complete a picture as possible of the documentary profile relating to Mr. Haughey’s health status, I persist in my attempts to gain access to this material. It was my intention that the medical practitioners I retained would conduct a review not just of the medical reports furnished by Mr. Haughey, but also of all the other relevant medical documentary material. In addition to requesting those medical practitioners to review the relevant medical documents, I also decided to arrange to have them examine Mr. Haughey. Ultimately, it did not prove possible for reasons which again I do not wish to go into at this point in detail, to obtain from Mr. Haughey’s advisers a complete documentary profile of Mr. Haughey’s health status. Eventually, I decided that notwithstanding the absence of a full documentary profile, I would arrange for the medical advisers I had retained to proceed to comment on the material to hand and to provide me with reports on the basis of their respective examinations of Mr. Haughey. I retained the services of two eminent medical practitioners practicing outside the country and wholly unconnected with any aspect of the work of the Tribunal. They are Mr. Gordon Williams and Professor Martin Rossor. Mr. Gordon Williams is a consultant urologist and transplant surgeon of international repute attached to the Hammersmith Hospital, London and to a number of other internationally recognised centres. Professor Martin Rossor is a consultant neurologist to the National Hospital for Neurology and Neurosurgery at St. Mary’s Hospital, London. He holds the chair of clinical neurology at University College London’s Institute of Neurology and is an internationally recognised practitioner with a special interest in the fields relevant to Mr. Haughey’s medical condition. Each of these doctors was provided with an account of the background to the Tribunal’s proceedings and the circumstances in which issues concerning Mr. Haughey’s health had arisen in recent months. They were requested to examine the medical documentation which had, in fact, been made available and to indicate their findings and their opinions as to the clinical facts. It was indicated to them that the Tribunal would have to satisfy itself as to the clinical facts as to the extent to which there may have been any significant deterioration in Mr. Haughey’s conditions so as to make it impossible for him to give evidence and as to the extent to which he would be capable of coping with giving evidence bearing in mind that every reasonable step would be taken to mitigate his disabilities. The Tribunal has been informed that Mr. Haughey is, in medical terms, fit to give evidence, but that in the circumstances of health status, special arrangements should be made to mitigate the disabilities from which he suffers. As I believe there are a number of matters on which Mr. Haughey can still be of assistance to the Tribunal, and as in his own interests he should also have an opportunity to comment upon material already led in public sittings, I have therefore decided that he should continue to give evidence to the Tribunal. It will not be possible for Mr. Haughey to give evidence in the course of the Tribunal’s sittings. Problems like this frequently occur in the course of ordinary court proceedings. They are usually resolved by what is described as the ‘taking of evidence on commission.’ this is a procedure provided for by the Rules of the Superior Courts and enables the High Court to make an Order for the examination upon oath before the Court of any witness and in due course, allows the deposition of any such witness to be adduced in evidence on such terms as the Court may direct. 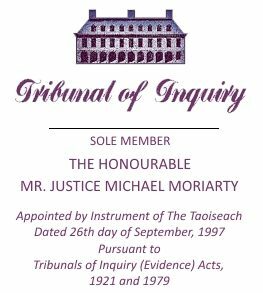 I have the power to make such an Order under the terms of Section 1(1)(c) of the Tribunals of Inquiry (Evidence) Act 1921 and, therefore, subject to the giving of notice to the appropriate persons, I propose in the exercise of those powers to make an Order for the examination of Mr. Haughey on oath. I envisage that this examination would be conducted in private and that this would be done with a view to alleviating the particular disabilities from which Mr. Haughey suffers so as to enable him to deal with the queries the Tribunal wishes to raise with him. I envisage that this examination would be conducted in Dublin Castle and that special arrangements would be made to facilitate Mr. Haughey’s examination in a private room. There would be a daily transcript of this examination. Having regard to the judgment of the Learned President of the High Court, Mr. Justice Morris, in Irish Times & Ors. v. Mr. Justice Flood (unreported High Court, 28th September 1999), this would be no more than the gathering of evidence for the purpose of tendering it to the Tribunal for its consideration. The transcript would not be made available to the public unless and until I had determined that the statement of evidence so harvested should be adduced in evidence at the Tribunal’s public sittings. The same goes for any exhibits which might be referred to in the course of the conduct of any such examination. I turn in conclusion to some matters relating to the progress and procedures of the Tribunal. An intention to conclude public sittings at the earliest feasible vantage point in the New Year has already been stated and I intend to adhere to that. The evidence relative to what may be termed the “Money trail” has largely been completed and other than the aspect referred to earlier, there remain only some limited matters of fresh testimony to be heard in this regard plus some limited areas already dealt with that require brief revisitation. A Term of Reference that remains almost entirely unaddressed is Term of Reference (j), which essentially requires the Tribunal to examine the degree to which the Revenue Commissioners addressed, evaluated and enforced the tax liabilities of Mr. Haughey and of Mr. Michael Lowry respectively. Extensive inquiries and investigations have already been carried out with a view to dealing promptly with these matters at public sittings. In this regard, a greater amount of evidence and documentation appears necessary in regard to Mr. Haughey given both his more complicated tax affairs and the longer period of relevant assessments there involved. It is proposed to recommence public sittings in this regard on Monday week, 18th December, with a view to concluding that aspect by Christmas if possible. A further public sitting may also be required for the latter part of next week and a further ‘private’ sitting (i.e. a public sitting from which the public will be excluded under Section 2 of the 1921 Act) may also require to be held. If the former proceeds, notice will be given in the usual manner. That will leave over until January next the evidence dealing with Mr. Michael Lowry’s relationship with the Revenue Commissioners. Then also, it will be necessary to turn to the matters of possible “acts” or “decisions” coming within Terms of Reference (d), (g) or (i). The Tribunal has to date examined a large volume of potential evidential material in this context, both with regard to matters felt by the Tribunal itself to merit at least preliminary investigation, and to the high incidence of matters referred to the Tribunal throughout its currency by a wide cross-section of members of the public. Whilst some of the matters have proved to clearly not have been the Tribunal’s Terms of Reference, all require attention and in some cases, even where it is ultimately found that insufficient grounds to proceed to public sittings are disclosed, extensive attendances and examination of documents made available by Departments of State have been required. As with other aspects of potential evidence, the Tribunal has taken the view that setting an unwarrantedly low threshold for proceeding to public sittings would both entail unfairness with persons likely to be affected and protract the Tribunal’s duration to more lengthy dimensions. With these considerations in mind, it is envisaged that a limited number of such acts and decisions will be identified and addressed in the concluding New Year sittings. I turn lastly to the question of submissions, written or oral, which persons, whose interests could be affected, may wish to make to the Tribunal. This is an important part of overall procedures and a number of interested persons have already indicated an anxiety to be heard. Whilst obviously aware that a properly considered report must follow upon conclusion of public sittings as soon as is realistically possible, I am in no doubt that it would be inherently unfair to prepare any portion of that report until all relevant evidence has been evidenced and all interested persons have been given an adequate opportunity to make submissions. Accordingly, I have to date in this regard, confined myself to seeking to summarise the considerable volume of evidence already heard. Such submissions will, of course, assume even greater prominence in respect of those Terms of Reference where the Tribunal’s task is recommendatory rather than merely fact-finding. In trying to reconcile fair procedures with the avoidance of unnecessary delay, it seems to me at present, that the primary focus of submissions to the Tribunal should be in written form with a possible entitlement to supplement or reiterate at public sittings subject to appropriate time constraints. It may also be possible to make some limited use of the Tribunal’s website to convey substantive matters by way of submissions to members of the public. However, I shall not finalise arrangements in this regard until anyone affected who wishes, has had an opportunity to make representations.